The Hyperlink element is an inline-level content element that is used to add a hyperlink to a FlowDocument contents. You can add hyperlink support to any Inline element. 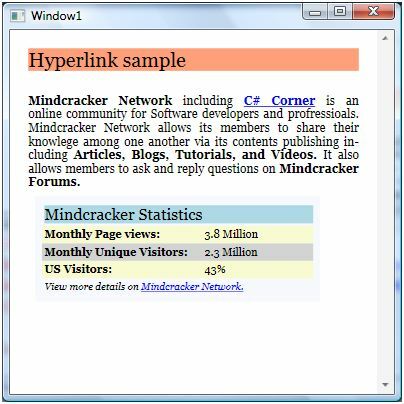 Hyperlink is defined in System.Windows.Documents namespace. You must import this namespace before you use Hyperlink. Here is the Italic syntax for Hyperlink. Here is an example of hyperlink that sets NavigateUri to C# Corner website URL. Listing 1 is a complete example that shows how to use a Hyperlink element in FlowDocument contents. The output of Listing 1 looks like Figure 1. The Hyperlink class in WPF is used to add a hyperlink to a FlowDocument. The code snippet in Listing 1 creates a hyperlink dynamically.